Advertising and trackers are a big problem on many websites. Pages load slowly wasting your time, draining your battery, and using up your mobile data. Even worse, ads sometimes serve malware to unsuspecting users. To take back control, you need 1Blocker X. In the unlikely event that 1Blocker X doesn’t have a rule you need, you can add your own too. One aspect of content blocking that often gets forgotten is that they aren’t just about blocking ads. 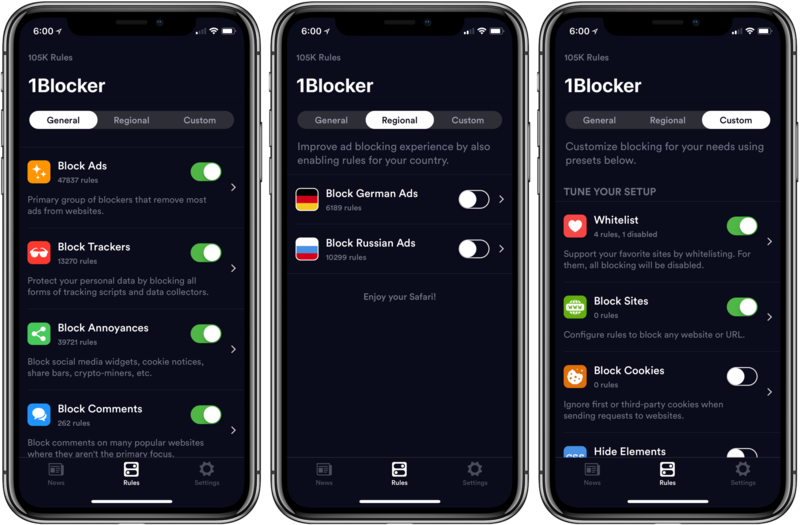 1Blocker X also eliminates distracting page elements like social network share buttons and comments that get in the way of an enjoyable web experience. You can even hide individual elements on a webpage with 1Blocker’s powerful action extension. All you have to do is invoke the extension, tap what you want to hide, and then save. It’s incredibly simple and effective for page elements that aren’t already blocked by 1Blocker X’s extensive built-in rules. So don’t wait, go get 1Blocker X today on the App Store or if you’re feeling lucky, enter to win one of 30 copies of 1Blocker X that we are giving away here. The giveaway will be open until Noon Eastern time on Monday, July 23, 2018 and winners will be contacted within 7 days thereafter. Our thanks to 1Blocker X for sponsoring MacStories this week.